A leaking concrete block / cinder block foundation is a challenging reality for many homeowners living in homes built between 1920 and 1980. On this page we explain why block foundation walls leak and how these types of foundations are waterproofed. How can you can tell if your block foundation leaks? You can easily tell if a concrete block foundation leaks just by observing the presence or absence of staining on the blocks. There is no denying it. 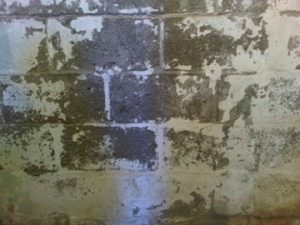 If your foundation walls appear in any way similar to the images above, you have visual confirmation that your concrete block / cinder block walls either have water trapped inside the blocks or moisture wicking through them. If your walls do look like these images, it is highly likely that you have at least occasional basement leaks, with moisture wicking through the blocks into the air in your basement causing a damp basement, and/or water entering your home beneath the basement floor slab. Unfortunately, these ideal conditions lead to the premature deterioration of your foundation walls. There is only one way to solve this problem: waterproof your foundation. 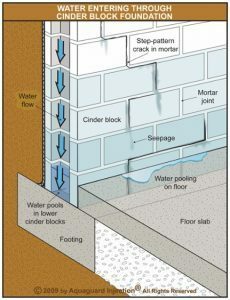 The illustration below depicts the typical flow of water within concrete block basement walls. 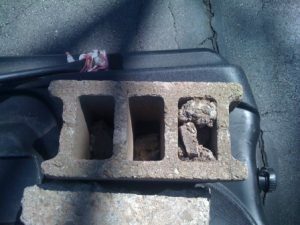 Why do concrete block / cinder block foundations leak? Block foundation walls have an inherent weakness in that there are mortar joints on all sides of the blocks (the same as any brick wall). There is a general tendency for mortar joints to develop some hairline cracking over time, typically due to the swelling and shrinking (eg. expansion and contraction of clay soils) of the soil in response to soil moisture levels. The more water there is in the soil, the more pressure is exerted onto the cracked mortar joints. Note: A drop in the footing supporting the base of the foundation (settlement) also results in mortar joint and block cracking. Below-grade hairline cracks in the mortar joints, and cracks in the blocks themselves, are constantly subjected to hydro-static pressure from the water table surrounding the foundation, thus facilitating the entry of water into what are essentially hollow blocks. 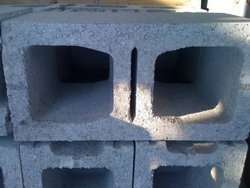 Here are some images of the concrete blocks / cinder blocks that are used in the construction of a foundation wall (concrete block foundation construction was the norm in residential construction between 1920 and 1980). Can you inject leaking concrete block walls? Homeowners are increasingly aware that pressurized injection (epoxy and polyurethane) is a very economical way to waterproof a leaking basement; consequently, we receive numerous requests for the injection of block walls. Unfortunately, pressurized injection is not a viable way to waterproof concrete block foundations because the blocks are hollow, thus making it impossible to contain the injected resins in the area(s) where water is penetrating the foundation. 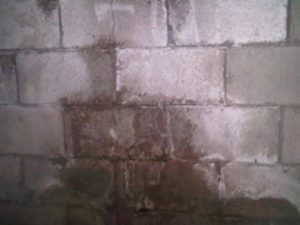 Does applying interior sealants on leaking concrete block walls work? Some seemingly knowledgeable individuals and companies would have you believe that the application of a waterproof sealant, or tar-based product, on the inside surface of a concrete block or cinder block wall will fix your leaky basement. While sealing a concrete block foundation wall from inside your basement may temporarily resolve a basement leak, this form of basement waterproofing will, actually, trap water within the foundation wall and effectively prevent any evaporation of the moisture trapped inside the blocks. As concrete is a porous material, the resultant pooling (entrapment) of water within the cinder-block wall will, eventually, accelerate the deterioration of the blocks to the point of failure and, with the passage of time, lead to far greater repair costs and potentially damage the structural integrity of sections of your foundation walls. Surface sealants must be applied on the exterior foundation wall surface in order for the foundation to be properly waterproofed. Logically, foundation damage and water penetration of a block foundation would be averted by preventing water from entering the concrete blocks in the first place. In fact, this is accomplished by excavating and waterproofing (coating) the foundation wall. Alternatively, when destructive excavation is undesirable or money is to be saved, entrapped water in a concrete block wall can be purged, and your basement waterproofed, by installing an interior weeping tile / perimeter drainage system. Both of these basement waterproofing methods will greatly decrease the rate of deterioration of your foundation. Over the years we have encountered numerous situations where foundation walls need to be rebuilt or reinforced to avoid foundation failure (often the result of years of neglect of a known problem). The cost to rebuild a wall or to reinforce it is significant; you want to avoid such a situation if at all possible and block foundation waterproofing is the place to start. The waterproofing contractor you choose. As mentioned above, when dealing with a concrete block foundation there are only 2 professional block foundation waterproofing repair methods. Ready To Look After Your Wet Basement Problem? Selecting the most suitable basement waterproofing method should always be done in consultation with a true waterproofing professional because expertise is essential. It is a fact that many plumbers, restoration companies, general contractors and landscapers try to increase their sales by selling waterproofing services. While their waterproofing work might last a few years, if the basement waterproofing is not done properly, another contractor will have to do the entire job all over again. If you do not have the work done by a reputable and established waterproofing contractor with an excellent rating from the Better Business Bureau, how likely is it that your contractor will acknowledge that they are responsible and do the work again at no charge to you? Additionally, waterproofing work requires skill and experience; the importance of the many minor details involved in basement waterproofing cannot be overstated. In reality, the average homeowner is unable to differentiate between an excellent waterproofing job and a lousy job when the job is done. 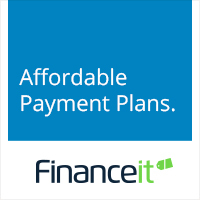 Finding out a few years down the road that your waterproofing was done poorly will probably cost you more than you paid in the first place.